The F series is cost-effectively designed using threaded coupling interfaces and the plug utilities the center contacts of the cable rather than a separately applied pin. 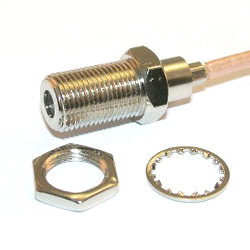 This series is specifically designed for use with NTSC TV Antenna applications. F Str. Jack Bulkhead Crimp Type. 1. Suitable cable: (1) RG59. (2) RG179. 2. Impedance: 75 Ohm. 3. Frequency range: 1.0 GHz. 4. Working voltage: 250 VRMS Max. 5. Dielectric withstanding voltage: 500 VRMS 6. VSWR: 1.35 max. 7. Contact resistance: (1) Center contact: 5 milliohm max. (2) Outer contact: 1 milliohm max. 8. Insulator resistance: 1000 Mega ohms min.